The lake district including more than 50 former glacial lakes, is liked very much as a full day excusion. 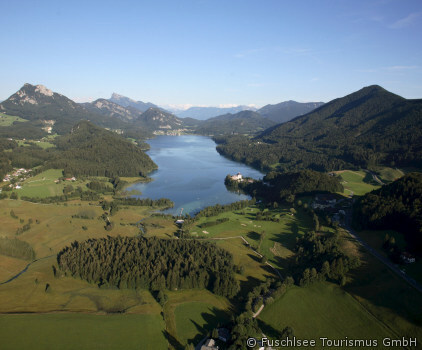 Along the national road, we reach the first Lake Fuschl, beside pitoresque village with the same name. The next point after 15 minutes drive is St. Gilgen, Mozart’s mother’s birthplace. From the boat setting over to St. Wolfgang a magnificent view will arise. After lunch time I want to show you the altar of Michael Pacher at the church and the hotel “Zum weißen Rössl” will be an hour of walk through the village. On the way back to Salzburg, we pass by the village of Mondsee, well known for the Sound of music church. On the highway we will get back to Salzburg.